Today we had our second raw vegan “cookup”. 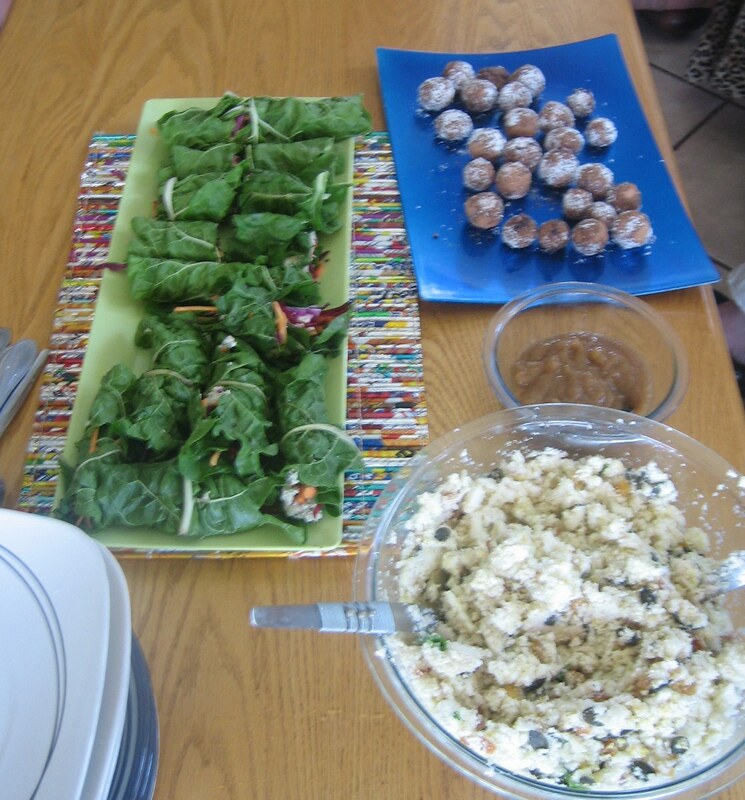 It was a great event with a feast of delicious raw food and a very interesting group of people. We made spinach rolls with sunflower seed pate and veggies as the appetiser, with a delicious and creamy red-pepper and sun-dried tomato dip. For the main course, we had Moroccan cous cous with date sauce. Dessert was date nut balls, rolled in coconut and cacao. Luckily we managed to snap pictures before it was all eaten! The raw food cookups are held once a month. For more information, check out the facebook group, Raw Vegan Sumtin. We will also be offering delicious raw take-away meals once a week, so keep an eye on the facebook group or this page for more information. ground coriander, himalayan salt and pepper to taste. Blend all pate ingredients together in food processor or blender until smooth. To assemble, cut the tough bottom part of the spine off of the spinach. 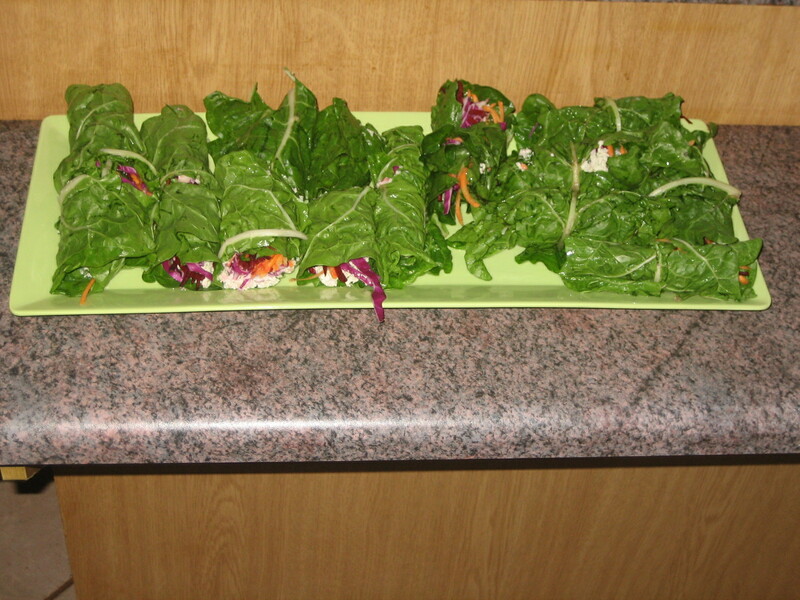 Spread some pate on the spinach, top with shredded veggies and then roll up like a burrito. Cut in half to serve. 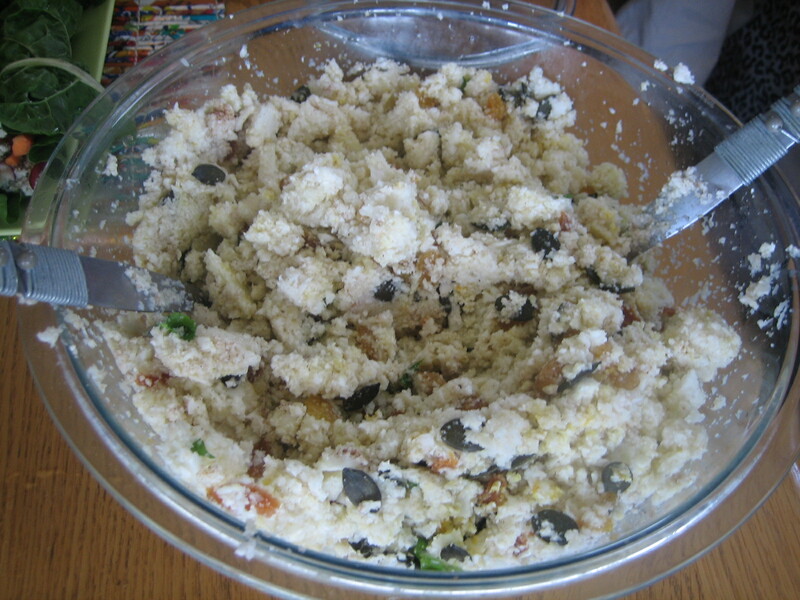 Put cauliflower in food processor and pulse into chopped. Add juice, oil and spices and pulse again until cauliflower is the size of cous cous. Transfer to a bowl. Add fresh coriander, dried fruits and seeds. Stir gently to combine. Add additional spices if needed. First, grind almonds in the food processor or blender until they are a fine powder. Then add dates and process until well combined. Add coconut, cacao and vanilla, and process until mixed. Transfer the mixture to a bowl. Make small balls out of the mixture, roll them in coatings of your choice. Then put in refrigerator at least 20 minutes, or until ready to serve. Yum! This entry was posted in cooking classes, desserts, main course, Raw Food, recipes, snacks and appetisers and tagged cooking class, health, johannesburg, raw food recipes, vegan recipes. Bookmark the permalink.